With real estate prices rising at an alarming rate all over the world, pre-fabricated modular homes are being increasingly demanded for cost-effective living. And the good news is that with advances in technology, these homes can be customised as per your requirement and are quite stylish too. Near Aberdeen, Scotland, we came across Schoolmasters, one such eco-friendly house created by the home builders at Build Different in Hove. 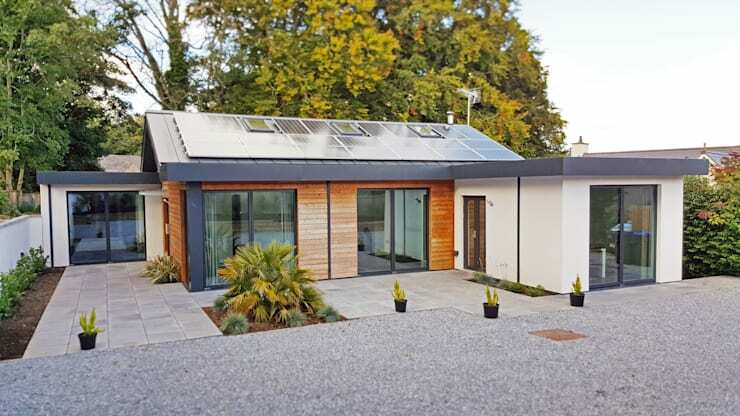 The single storey abode was built in West Sussex as 6 volumetric modules, and brought to Aberdeen with the help of a number of trucks. Let’s find out more about its elegant exterior, economical and sustainable properties, and bright white interiors with modish pops of colour. The structure makes use of renewable technologies and passive house design principles, so that running costs are low. It comes with 5.5kw solar PV array, biomass stove, and a solar switch for heating a 500-litre water store. 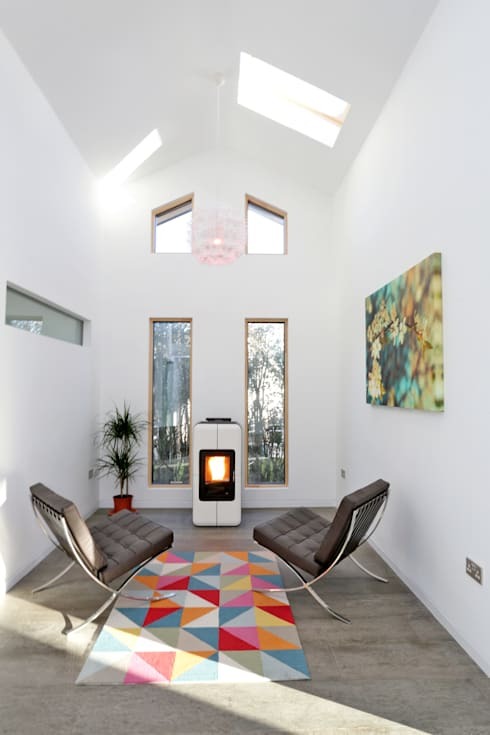 Additional heat during winters is provided by a pellet stove, and the airtight building is efficiently insulated too. The home also features triple glazed doors and windows which face south, and mechanical ventilation that keeps the air warm and fresh inside. Moreover, the avant-garde technologies used by the home can be controlled easily through ipads and smartphones. As far as looks are concerned, we are impressed by the sophisticated combination of warm wooden slats with white concrete and oodles of glass for a streamlined finish. The compact strips and squares of garden adorning the front of the house are accompanied by random potted greens which liven up the plain grey patio charmingly. It’s impossible to guess that this house was built in modules, when you look at the fashionable and modern open plan living. Different functional areas have been integrated smartly, with bright white walls, pillars and beams lending the aura of spaciousness. It might help you to know that not only are these homes constructed quickly and in different shapes and sizes, they take less time to be assembled onsite too. If you are a fan of pre-fab houses, check out this wooden one we think is perfect for Canada's cottage country. Large glass windows in sleek wooden frames allow adequate natural illumination and heating of the living area. Sleek grey couches offer comfy seating here, while a colourful rug with honeycomb patterns offer vibrancy along with the gorgeous flowers and quirky patterned cushions. A bright and striped rug right behind the table with the vase lend liveliness to the minimalistic area too. Since the home follows an open plan living style, the kitchen and dining exude the same airy and bright charm as the living space. Gleaming white surfaces punctuated by smooth black countertops, trendy black chairs and a chic pendant lamp, keep the monochrome magic alive here. 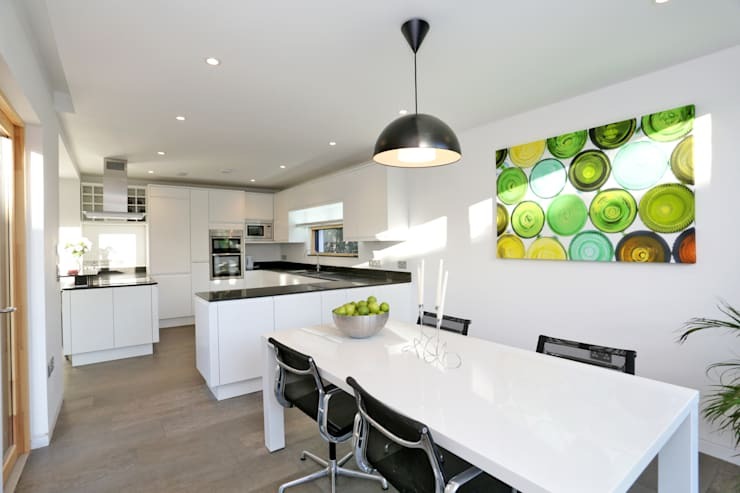 The kitchen is fitted with stylish appliances and ample cabinets for easy storage, while the dining area is spiced up with a vibrant geometrically inspired artwork. This sleek nook lies on the opposite side of the living area, and features the biomass stove we mentioned before. As the name suggests, the stove can be powered by wood pellets, manure or corn to continuously produce heat during cold months. Since it uses natural raw materials, it is extremely economical and safe for the environment too. A geometrically patterned rug exploding with myriad colours, a couple of cozy leather chairs, a vibrant artwork and a lush potted plant perk up this space, which is ideal for warm conversations. The sleek glass windows also bring in natural light and let you admire the beauty of nature from inside. Geometrically precise lines and shapes deck the cozy and compact bathroom in shades of white, grey and wood. A chic sink with stylish storage, trendy fixtures, a useful mirror cabinet, a slim open shelf and a chrome towel rack take care of both functionality and aesthetic appeal in this space. A cheery green striped floor mat lends a peppy touch, while the water gets heated with the electricity generated by the solar panels on the roof of the house. Since the abode faces south, its solar panels receive the maximum amount of sunlight possible, thereby ensuring that the passive house principle is followed. The large glass doors and windows are triple glazed so that the interiors get sufficient sunlight and stay adequately insulated. Also, the indoor air stays fresh and warm due to a heat recovery system. This wonderfully planned prefabricated home is environment-friendly, technologically advanced, spacious and stylish, and has everything to make living comfortable in an affordable and sustainable manner. For more inspiration, take another tour - This Family Home is Perfectly Pretty.